John Lear - UFOs, 9-11, Moon Landing, Cover Ups, Conspiracies, Disinformation, Mark Richards, More. Guest:Whitley John Lear Website: https://thelivingmoon.com/ John Lear is a retired airline and for the past 25 years John has researched the subject of UFO's and other related conspiracies. He insists that the United States Apollo missions never went to the moon and that the moon is inhabited with a civilization of more than 500 million humans like us but considerably more advanced who did not come from earth. John's research holds that our solar system has 40 planets not 9 and that all planets and their moons and satellites are inhabited by humans similar to us as well as Extra Terrestrials. He further he states that mankind was conceived, engineered and built by ET's who secretly control our lives and that mankind is only one strand of an infinite number of strands of life. ANTIGRAVITY: During the period from 1958-1960, T. Townsend Brown spent time working with Agnew Bahnson and J. Frank King Jr. in North Carolina at the Bahnson Labs. This is the complete video.
" this technology has been fully developed by the US government the first manned prototype craft was flown in 1961. Townsend Brown's daughter, Linda, has only a slight understanding of what the technology does. You can see a small prototype with their that I built and flew on my YouTube channel. The best way to describe this type of propulsion system is that it is warp drive. Townsend Brown discovered that gravity also has a positive and negative charge, just like electricity and magnetism. By applying very high voltage DC to a capacitor, the positive charge creates what is known as a gravity well and the negative charge creates what's known as a gravity Hill. Combining both of those creates a gravity wave, like a surfer on a surfboard. The video shows lifters of a type that I call umbrellas causing left using this technology. For you to fully understand it, first you must read a lot of material that is on it. One document that you should get is titled electrogravitics systems. Also you can acquire copies of the patents of Townsend Brown.you can also find more information at the Townsend Brown family website. http://www.thomastownsendbrown.com/ "
In this part John Lear and I compare notes on multiple topics we have both investigated over the years. We deal with Dulce, Flight 370 and MH17 and John's reaction to the ground breaking Mark Richards info about Vietnam. This is the best of the three! CORRECTION : AT 42:058 - I talk about "FREEMANTLE" WHICH SHOULD BE CORRECTED. IT WAS THE COMPANY CALLED FREESCALE - A FORMER DIVISION OF MOTOROLA THAT BROKE AWAY AND BECAME IT'S OWN COMPANY. 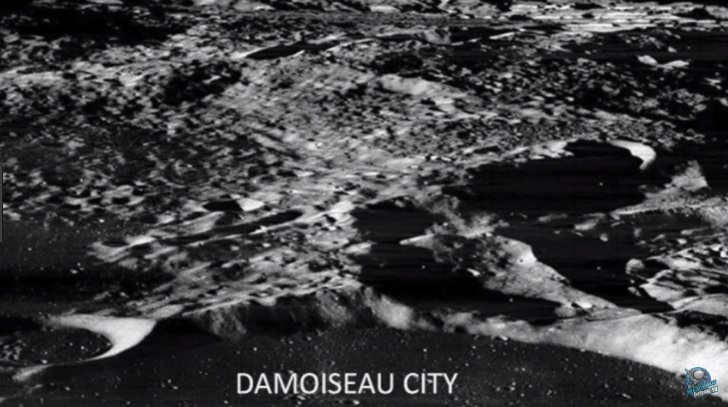 Damoiseau is a lunar impact crater that is located just to the west of the Oceanus Procellarum, in the western part of the Moon's near side. It lies due east of the prominent crater Grimaldi, a walled plain with a distinctive dark floor. Due south of Damoiseau is the crater Sirsalis. The low outer rim of Damoiseau is not quite circular, having an outward protrusion to the northeast and smaller bulges to the north and southeast. The interior floor is irregular and complex, with a series of ridges and small clefts (similar to Vitello). 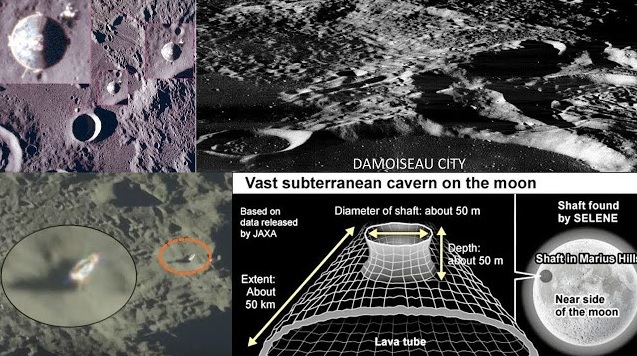 The crater is concentric with a larger, older crater designated Damoiseau M that is approximately twice the diameter. This outer feature is missing a rim to the northeast where it intersects the lunar mare. To the southeast is a rille system named the Rimae Grimaldi. This continues to the west and south, for a maximum dimension of 230 kilometers. 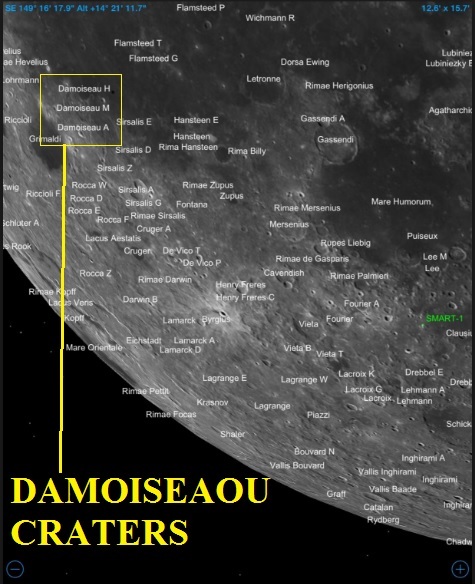 By convention these features are identified on lunar maps by placing the letter on the side of the crater midpoint that is closest to Damoiseau. Oblique view of Damoiseau (right of center) from Lunar Orbiter 3, facing southwest. 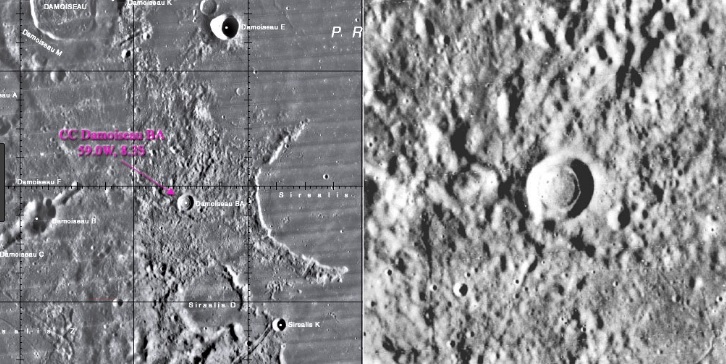 The flat plain in the foreground is Oceanus Procellarum, and the semi-circular "bay" below center is Damoiseau H. The small crater at far left adjacent to Damoiseau H is Damoiseau L. The south wall of Damoiseau M is visible, concentric with Damoiseau itself. Damoiseau A is behind (above and to the right of) Damoiseau. Menzel, D. H.; Minnaert, M.; Levin, B.; Dollfus, A.; Bell, B. (1971). "Report on Lunar Nomenclature by the Working Group of Commission 17 of the IAU". Space Science Reviews. 12(2): 136–186. Bibcode:1971SSRv...12..136M. doi:10.1007/BF00171763.